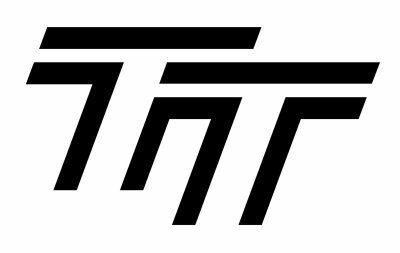 Here are things to know about TT products. How they work, what you can do for different configurations and ideas for setting up your bike so it works for YOU. Seat the fork top bolt off the brace so it doesn’t put downward pressure on it. Act as a crush washer to prevent fork oil from migrating out the threads. Provide an extension to the fork tube for the brace to clamp on. 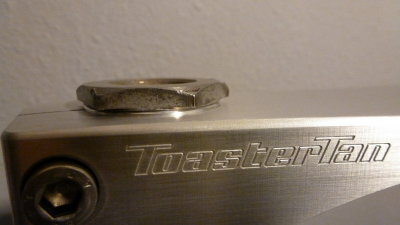 This design is unique to ToasterTan braces. 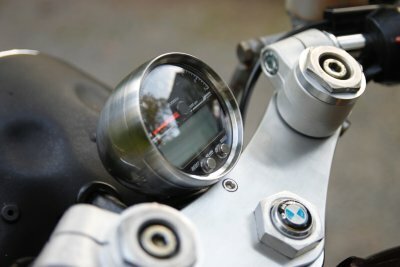 The stanchion top bolt plays NO part holding the forks, which eliminates the need for 78 ft/lbs of torque the stock plate requires. It only seals the forks from leaking. Servicing the forks is easy as can be and fork alignments become quick and simple. 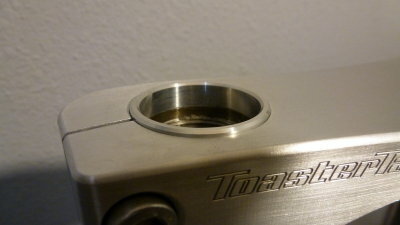 TT braces have a smooth bore so the stanchion can slide up through to lower the bike. 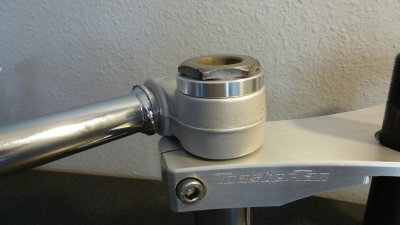 When this is done on a twin shock bike with 36mm tubes it leaves a gap between the fork tube and top bolt because, without the BMW top plate, it bottoms out in the threads. TT Café Spacers are used to bridge this gap. 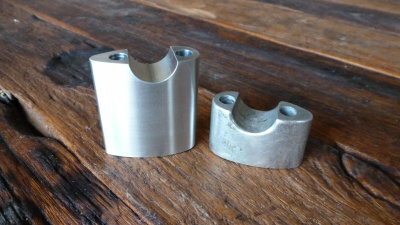 They are CNC machined 7.7mm thick with a bevel on both sides. They fit perfectly under the top bolt and provide a finished look. 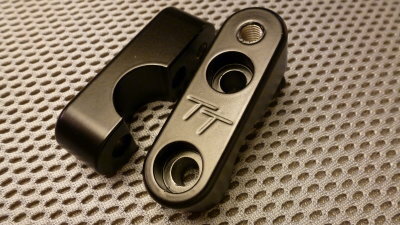 Installing Hi-Risers or TT Auxiliary Mount Caps on a bike requires longer bolts. These lengths vary if they are top down or bottom up bolts. Even the heads are different when installing a /5 vs. Standard /6-7 brace. The /5 brace requires four, 8x55mm, socket head bolts to come up from the bottom, which means you have to pull the studs out of the stock caps. This can be done using two jam nuts. When installing Hi-Risers on a Standard /6-7 brace you need two lengths to allow for the thickness of rubber grommets on the instrument bracket under the brace. 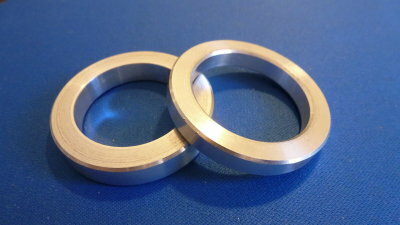 The front grommet is 5mm thicker than the rear. 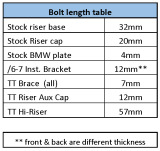 You can use this table to determine bolt length needed with different parts stacked. Remember, if they are top-down you need enough at the bottom to install a nut. 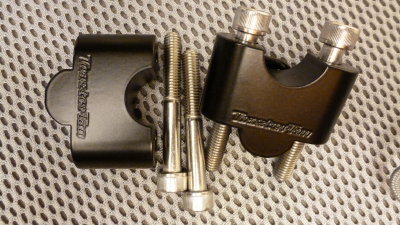 If you switch from the tear-drop cap to a TT Auxiliary Mount cap the fastener becomes a top-down. This means there must be enough protruding out the bottom to thread a nut. Add the width of the nut + 2 threads. 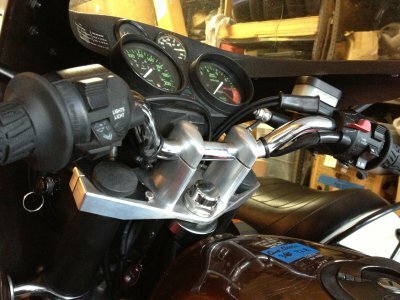 When mounting TT caps on a GS with a cast top brace the stock bolts work. 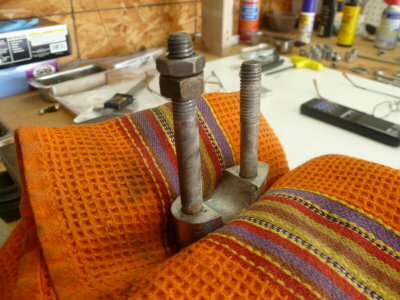 If you are also installing Riser Spacers the longer bolts come with it.